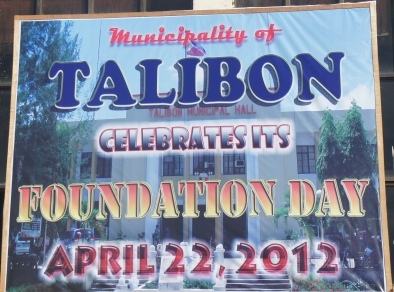 Like a child looking forward to its birthday, the Municipality of Talibon, excitedly arranged activities to highlight the said date for never, in the past century and a half, has its founding day been celebrated. 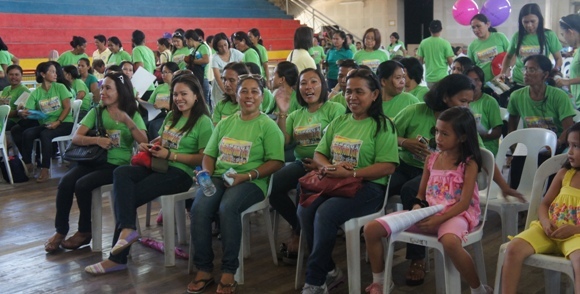 In spite of April 22 falling on a Sunday, the LGU employees and other National and Provincial Offices answered the call of the Municipal Mayor Restituto B. Auxtero for a 100% attendance in all the activities lined up for the day to celebrate this much awaited event. God was with Talibon that day! The day dawned bright, clear and sunny! 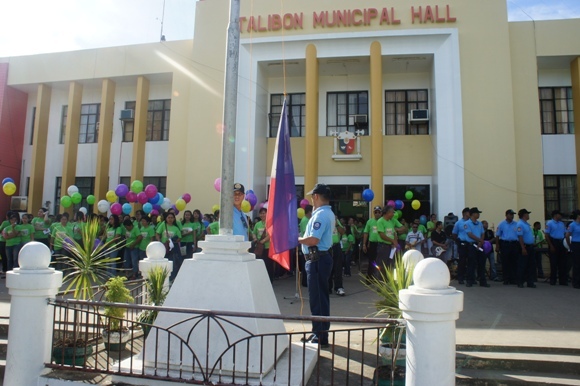 All employees of the Municipal and National Offices, Barangay Officials, convened at 7:30 a.m. in the morning at the Municipal Hall grounds for the synchronized Flag Raising Ceremony. 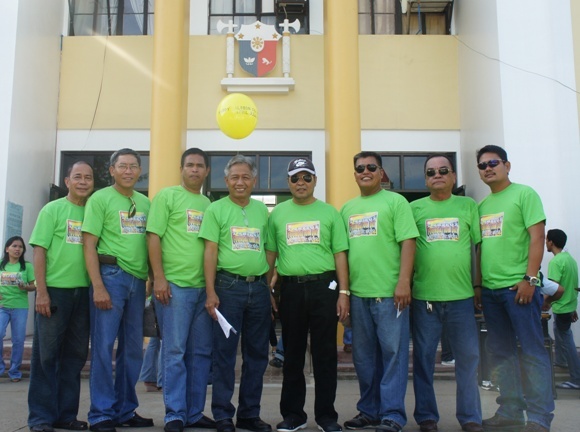 25 flag poles, hurriedly mounted for the said occasion, represented the 25 barangays of the municipality and were graced by the presence of each of the barangays’ officials and members. 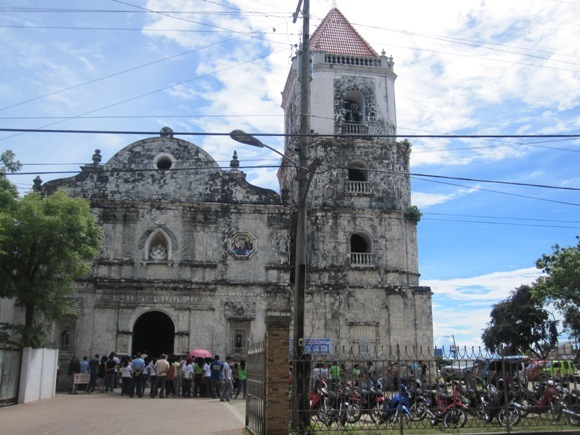 A Thanksgiving Mass at 8:30 a.m. followed at the Talibon Cathedral with Rev. Fr. Adonis Madanguit, officiating. It was a fitting gesture of the Talibongnons, from the deepest recesses of their hearts, gratefully thanking God for such a historical event to occur in their LIFETIME. That now, they have a birth date to look forward to….. to hold dear……and to celebrate! A motorcade followed. Employees with motorcycles and rides joined in. Those with no rides, hitched. 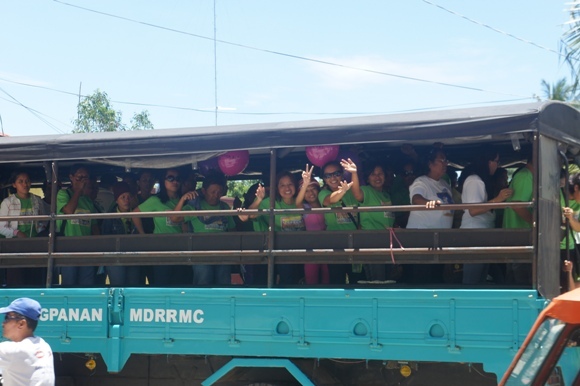 All municipal services were used from the Mayor’s, the SB, the DSWD, the LGU, even the garbage truck and the biggest truck, the “Dangpanan”. Other private individuals joined in. Balloons which were supposedly prepared for the different rides were carried instead by the employees and their participating children. Upon seeing the cluster of balloons at the Municipal Hall lobby, and in their excitement, they took one or two each and paraded them proudly! Well, the motorcade was still colorful with the balloons carried by the people. There was a lull in the activities after the motorcade. 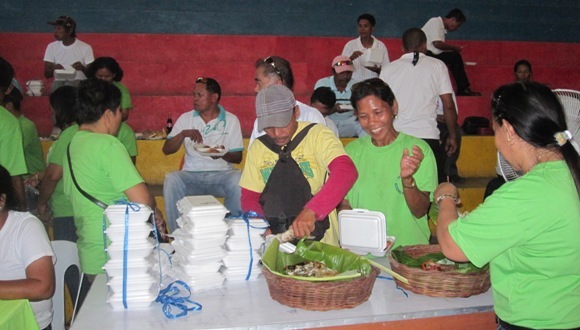 Instead of convening at the CPG Multi-purpose Center for lunch, most of the participating groups had their lunch at their offices and so only a few remained and had their lunch at the Center. The people there were well entertained though. The Municipal Band played. Engr. Ednardo Avenido and Mr. Jett E. Boyles took turns and sang ballads and love songs. That made for a full repast of fried chicken, bam-i and a dessert of leche flan! 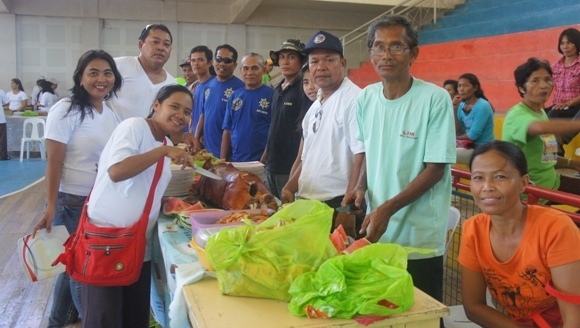 Well, that was for the Mayor’s and HR group, but for others, especially that from the barangay of San Agustin, no less than a LECHON made it to their table! The program started at little after 1 p.m. 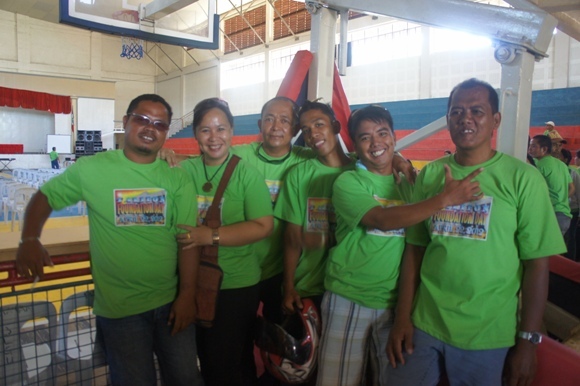 It was graced by Mr. Isabelito Tongco, representative of Governor Edgar M. Chatto; Hon. 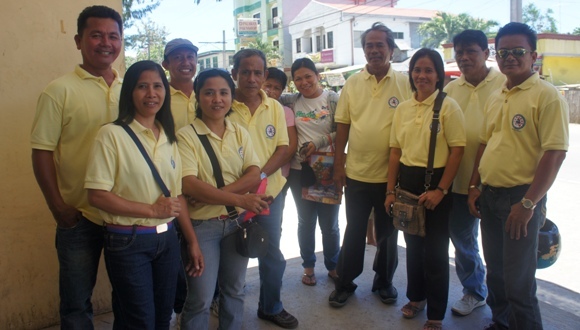 Erico B. Aumentado, Congressman, 2nd District of Bohol; by the Municipal Mayor, Restituto B. Auxtero and wife, Cyd; the Municipal Department Heads; SB Officials with Vice-Mayor Marcos Q. Aurestila and wife Esmeralda and daughter Jane, ABC President Dominador A. Salmeron, Vicente P. Auza, Dave A. Evangelista, Nomie T. Valmoria, Gershon N. Dulang and Concordio R. Evangelista. 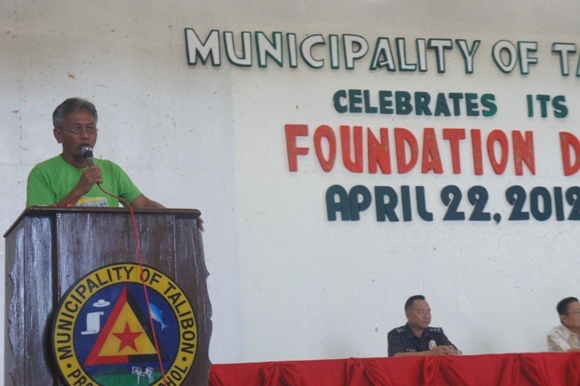 The affair was also graced by the presence of the Police Chief, Narciso C. Abapo and BJMP Jail Warden, Ebylino Escaño; Mr. Fortunato Avenido, the LGU Education Consultant; Barangay Officials and employees of the Municipality of Talibon. 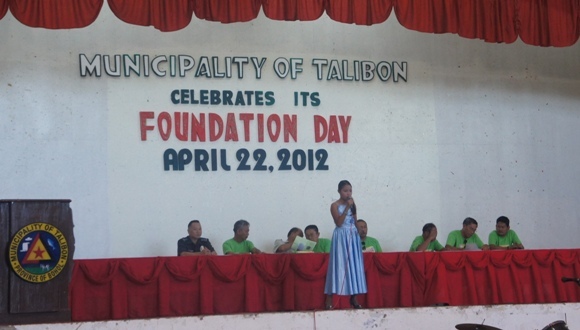 A video presentation was done simultaneously on two screens, illustrating the intensive research and efforts done by then Vice Mayor Restituto B. Auxtero on establishing the foundation day of Talibon; and the why and how April 22 was finally arrived at. Rather than giving a monotonous and boring monologue, the video presentation was an apt and proper way in presenting this historical work. Intermission numbers were performed. First to present was a group from the PCPG High School with their “Chair Dance” number followed by the San Jose National High School Performing Arts Guild with a Family Oriented Drama Presentation followed by a religious-oriented presentation by selected Blessed Trinity High School Students. The latter group was supposed to perform the Doxology but arrived late, still, their presentation fitted into the gist of the program and called for God’s blessing upon Talibon. 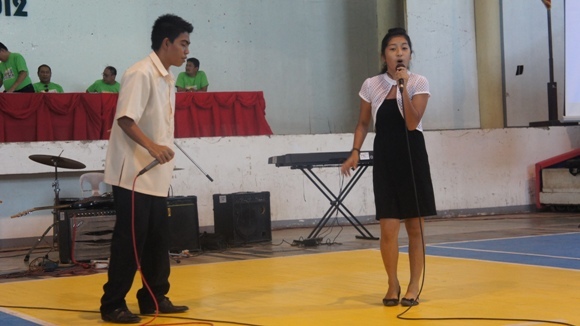 Next was a duo dance presentation from the Zosimo Gulle Memorial High School of Brgy. 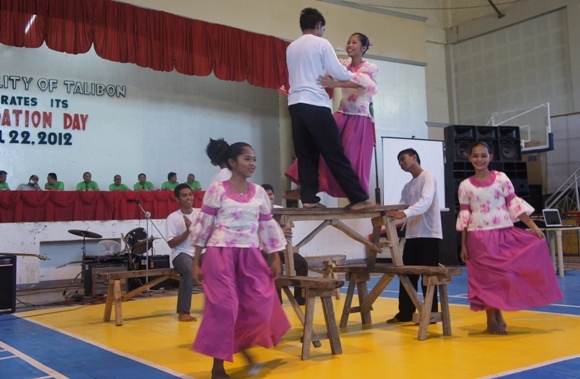 Bagacay and a song-drama rendition were presented by students from the Ponciana Leoligao High School of Brgy. San Francisco. 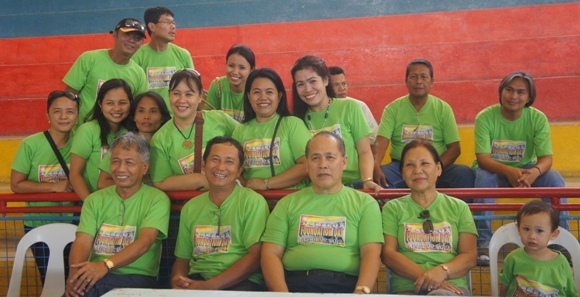 The Bohol Institue of Technology-Talibon also contributed by rendering a song. These presentations just showed that Talibongnons are talented! Hon. 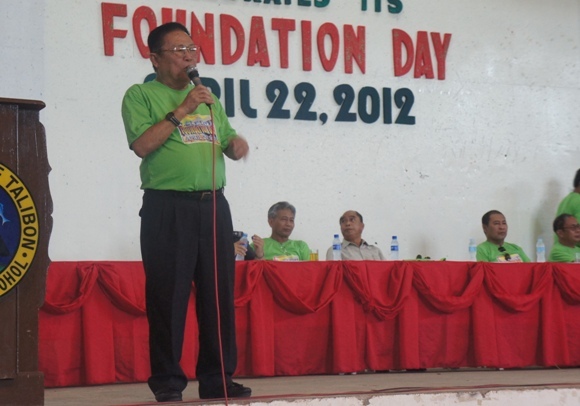 Erico B. Aumentado was then called upon to give a short talk. 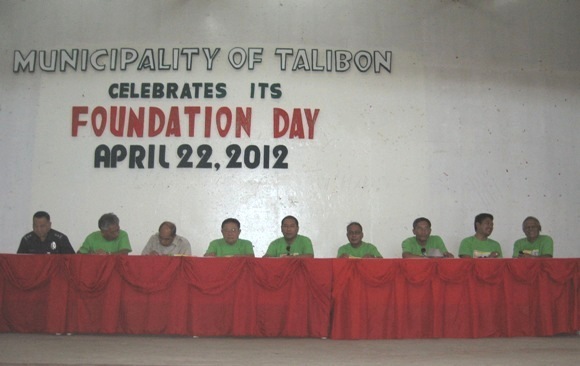 He gave his felicitations for the 1st ever Foundation Day of Talibon and calls for solidarity and action from the Talibongnons for the progress of the town. 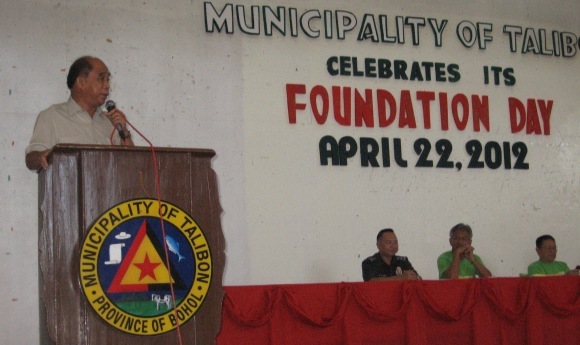 He presented several projects that are on-going, such as the Zamora Bridge and the Dam, envisioned hopefully to alleviate the conditions of the Talibongnons. He especially mentioned that, with Governor Chatto, they are sponsoring a P750,000.00 worth Cataract Operation Mission in Talibon come November 3 to 5, 2012. That is good news indeed! A “sayaw sa bangko” (bench dance) followed. With bated breath, the people followed each dance steps that called for jumping from one bench to the other and back. More so when the benches where piled up and the dance continued at the 3rd level. Onlookers tensed. Near the end of the dance and at the blink of an eye, the female lead dancer fell off the bench when attempting to jump to another bench. The people shouted. Everybody was relieved when she stood up and was not injured. Come to think of it….was falling off a part of the show? It surely caught everyone’s attention! The tension was lifted when Mr. Isabelito “Tatay Billy” Tongco, Governor Chatto’s Chief of Staff of External Affairs, took the rostrum. After giving his felicitations, he entertained the multitude with his “balak” (poetry) “Kahayag nga Binukutan” that verge on the “green” description of the Filipina’s hidden anatomy. The poem ended with the populace roaring in laughter. 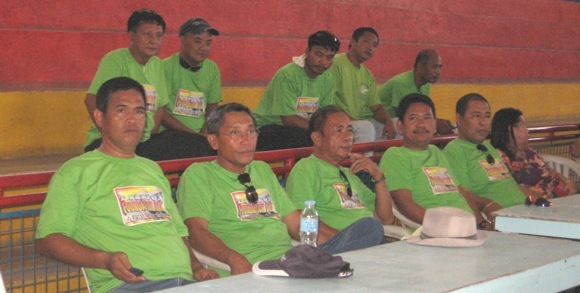 Two other presentations were done before the Closing Remarks of the Vice-Mayor, Marcos Q. Aurestila: one was a guitar exhibition of Mr. Roly Ceniza, the lead guitarist of the Municipal Talibon Band with Mr. Leo Dennis Tubo on the drums and Mr. Reynato Sayson on the Bass Guitar. It was a real show of skill and talent! 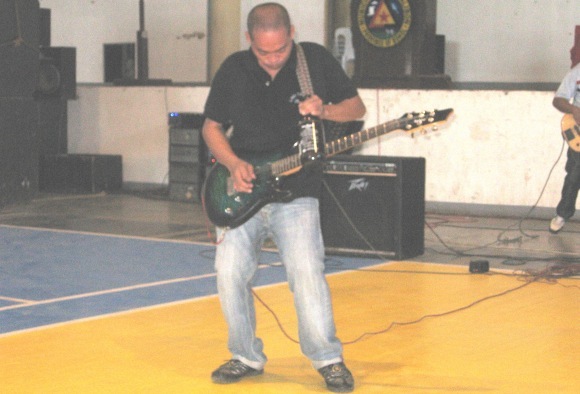 Mr. Ceniza used his teeth, a beer bottle and other materials and still played non-stop music, ending with an exhibition with the guitar at his back and still playing music to an upbeat tempo. That is real talent good for the “Talentadong Pinoy” Show!!! 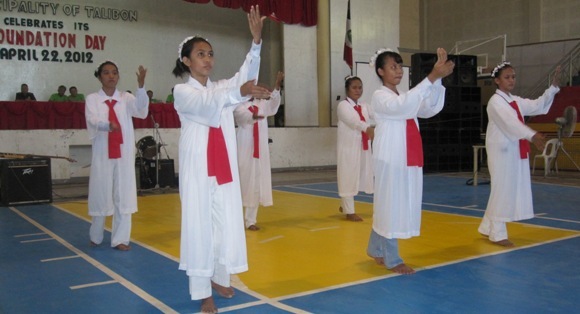 The “last but not the least” was a dance presentation from a group of twenty and more teachers from the San Isidro Integrated School. 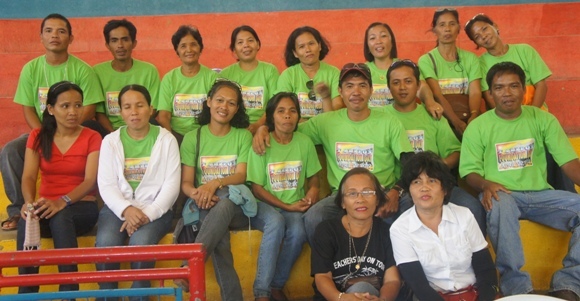 Garbed in purple t-shirts and white pedal pushers, the teachers danced to a fast beat. It seems that they have practiced for a long time, since not one of them committed an error. They have memorized each step by heart! 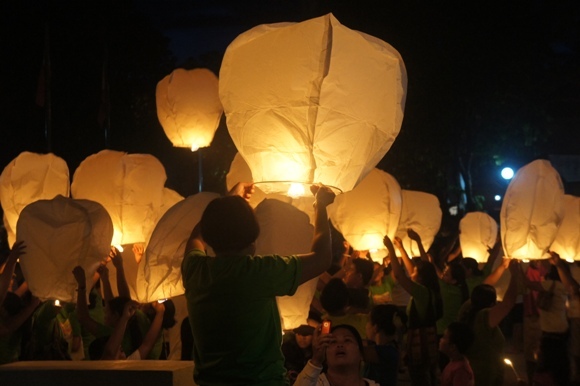 The program ended at about 4 p.m. Again, Mayor Auxtero exhorted the employees and guests to be present and witness the Sky Lantern presentation at the Municipal Plaza. 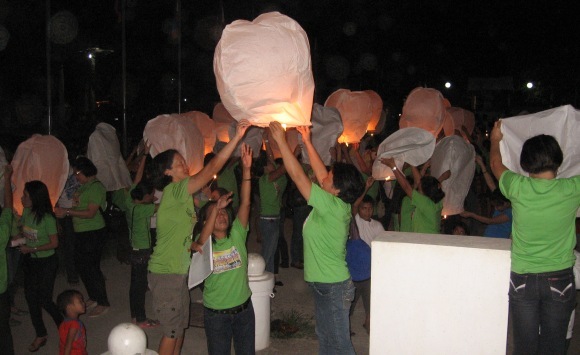 The sky lantern presentation will be a first also in the Municipality of Talibon. Previously, it is the practice of the municipality to render fire works to accentuate important activities. Yet the assigned committee to the Foundation Day celebration wants to try the sky lanterns which have become a fad in other places. 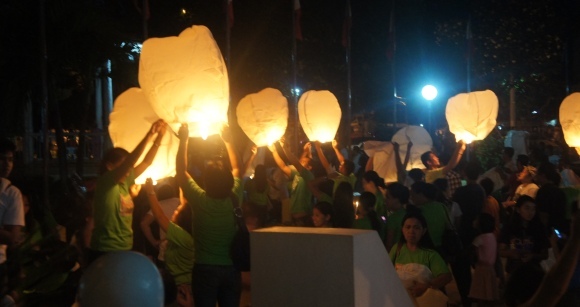 At dusk then, the LGU-employees convened at the Municipal grounds to release 182 lanterns, likewise to commemorate the 182nd Year of Talibon’s Feast of the Blessed Trinity. Even after a whole day affair beforehand, the employees and their families were still energetic and excitedly listened to instructions on how to light up the lanterns. Bystanders were also asked to participate. Two people per lantern: one to light up the small candle attached and one to hold up the paper balloon. At the count of three, those ready lighted up the candles simultaneously and patiently waited for them to light up. One by one the candles ignited. One by one the balloons filled up. One by one the balloons were released and with the help of a slight wind, floated up in the night sky. It was a spectacle. Young and old alike jumped for joy. Hundreds of lighted lanterns going up and up were a sight to behold! A few burned up and fell. For a moment, everybody was fearful. 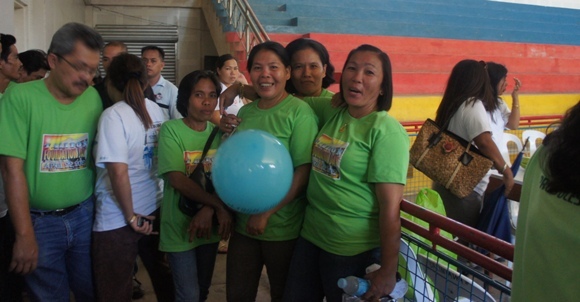 But the sight of the floating balloons dispelled fears and filled up hearts with warmth and joy. Those who have released a lantern went to light another one until all lanterns were lighted and released. 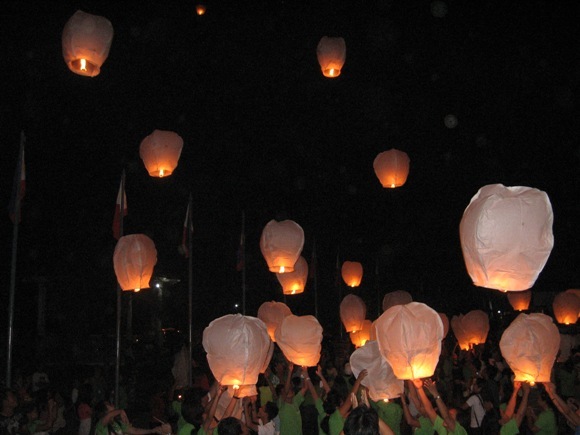 Even the loss of the Talibon Team in the Basketball Exhibition against the Avon-Mandaue Team of the Lopena’s, following the sky lantern presentation, was not able to squelch the joy and excitement brought about by the lantern release. 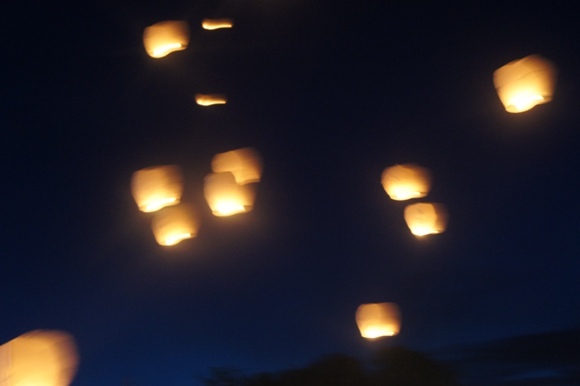 The memory of the lightened lanterns going up slowly in the night sky lasted. Come Monday morning, it was still the lively topic of those who witnessed the event. It eclipsed all other activities of the Foundation Day! For a first, we can deduce and say then that the Foundation Day of 2012 was a resounding success! All efforts have not come to waste. Everything turned out fine. But this is only the beginning. There will be forthcoming Foundation Days, God willing. In God’s hand and for now we can only shout…..Viva Talibon!